RxDentistry: Question A male infant was born at 28 weeks of gestation by cesarean section for preeclampsia. What is the diagnosis? Question A male infant was born at 28 weeks of gestation by cesarean section for preeclampsia. What is the diagnosis? This male infant was born at 28 weeks of gestation by cesarean section for preeclampsia. Staphylococcus aureus septicemia developed, and he was treated with broad-spectrum antibiotics. He became deeply jaundiced, probably because of infection, prematurity, and parenteral nutrition. The peak total bilirubin level was 20.9 mg per deciliter (357 μmol per liter) (conjugated level, 13.9 mg per deciliter [238 μmol per liter]). Ultrasonography confirmed normal hepatic and biliary anatomy. After a protracted course, he recovered and was discharged at 12 weeks. At a follow-up visit at 20 months of age, his mother noted that his teeth were discolored. Physical examination revealed green primary dentition, predominantly over the incisal two thirds of the anterior teeth, which corresponded with amelogenesis (enamel formation) during the period of sepsis (Panels A and B). 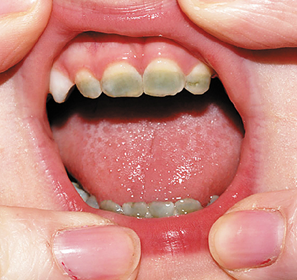 Permanent green pigmentation of primary dentition can result from neonatal hyperbilirubinemia that is classically seen in biliary atresia. Other causes include hemolytic disease and cholestasis caused by severe neonatal sepsis, as in this infant. A small portion of the permanent molars develop in utero, so secondary dentition can also be affected. Treatment options include veneers for primary dentition or combined veneers and bleaching for secondary dentition. No treatment was undertaken in this infant because he was lost to follow-up.